YogaSpark = hot power yoga. with a spark. Always hot, always open level, always fun. That’s YogaSpark. It’s not yoga for beginners, but beginners can do it. Trust us! We offer modifications and amplifications to suit all levels of experience. A lot of people think that hot yoga is “harder” than other yoga or other forms of exercise. We actually think it’s easier, because the heat generally makes you more flexible. If you have never done yoga before, it might take you a few classes to feel like you’ve got the hang of it. Just bring a positive attitude, and remember to breathe! We're a hot yoga studio like no other. You can literally just bring yourself, and we'll take care of everything else. Yoga mats, grippy mat towels, hand towels, and fluffy shower towels are always included in the cost of your class. We sell bottles of water, and also offer filtered water in the studio for those of you with your own water bottles. As far as what to wear goes, we suggest going with something you can move in and aren't afraid to get super sweaty in. But our philosophy applies: You forgot it? We sell it. We feature an exclusive line of custom YogaSpark apparel from Rie+Ryn. Styles are always changing and sell out fast, so get 'em while they're hot. We also sell a variety of high-end yoga clothing from such chic fitness brands as Koral, Alo and HPE. YogaSpark is hot power yoga, with a Spark. In any given YogaSpark class, you might find: sun salutations, warriors, lunges, standing balancing, core work, upper body work, arm balancing, back bending, forward folding and hip-opening. It’s a full body workout. Practitioners of all levels of experience will be challenged. Every class is different, so your muscles and mind will never get bored. Perhaps most importantly, we always encourage you to listen to your body, back off when needed, and breathe. It’s YogaSpark in the night-time, and the vibe is a little more chill. The setting: peaceful and calm with tea lights scattered across the room. The lights will dim as the class progresses. The music: think old school hip-hop, R&B, and alternative. The sequence: flow-based, focusing on warriors, lunges, hip-opening, twisting, forward folding and backbending, with an extended Savasana. A slower paced yoga that concentrates on holding different poses for longer amounts of time. We will work on the mat, in a heated room, with only a handful of poses to target specific areas of the body. The heat works beautifully to push past any residual tension in the muscles and allows you to get deep into the connective tissue. While holding each pose, we use that time to reflect on the deeper, more mysterious aspects of ourselves and our practices which then allows awareness to unfold slowly. It can be just as challenging physically and mentally but offers a much needed balance to a power lifestyle. BlacklightSpark is a thing you must experience. Imagine our signature YogaSpark class but in a super dark room and lit by blacklights. The music and vibe are totally electric. Prepare to be transported to a far away place. And wear something white or neon! 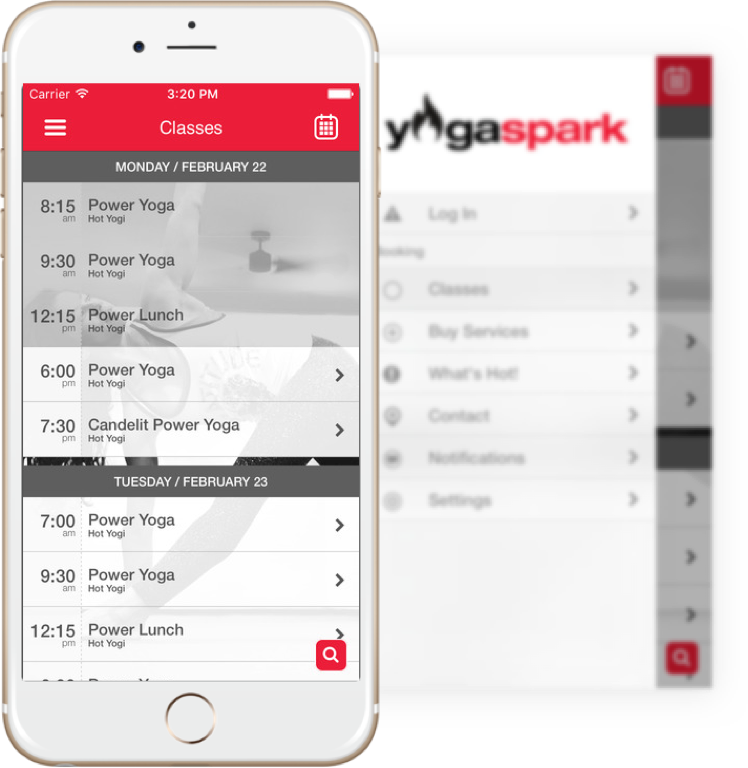 SuperSpark is the YogaSpark class to end all classes! Same signature YogaSpark class you know and love. We start out in regular studio lighting, but once we start moving a little faster, we flick off the lights and turn our blacklights on for a super electric vibe. You'll totally be able to zone out and move in a trance. When we are ready to slow down for the restorative section of class, we lose the blacklights and find ourselves sweetly surrounded by candlelights. It's simply the best combination of everything YogaSpark has to offer. As with BlacklightSpark, prepare to be transported to another place - and wear something white or neon! Only offered in our Tribeca location. DarkSpark is our late night gem! We start out with our warm-ups and flows in the Blacklight, but when we slow down for our restorative section, we lose the blacklights and find ourselves sweetly surrounded by candlelights. As with BlacklightSpark, prepare to be transported to another place - and wear something white or neon. Offered in Tribeca only. We'll get you on your mat in a hot second. Before you do anything, download our app. It makes booking and purchasing at YogaSpark a no-brainer. You can view your visit and purchase history and get to our social media pages from it, too! And if you’ve joined YogaSpark, you already have an account, so don’t worry about making a new one. Just log in using the email and password you signed up with. If you don’t know what email you used, or the app doesn’t recognize you, shoot us an email and we’ll sort it out: [email protected]. All of these capabilities are also available on MindBody online, but for speed and simplicity, you can’t beat the app. Everything awesome needs awesome rules. That’s how it stays awesome. Don’t worry, it’s pretty painless. We cap all classes at a reasonable number of yogis such that everyone has room to bend and breathe. If the class you want is available on the app/online, book it! If there aren’t any spots left, put your name on the waitlist (see below). If a class is full, or you didn’t make it into the class from the waitlist, you’re welcome to swing by, since any unclaimed spots will be given away when each class starts. You should still check into class at the front desk when you arrive at the studio. If you’re signed up for a class and need to cancel, do so 12 hours before the class starts. Otherwise, you’re a no show. If you’re a no show, your series will still be charged for a class. Annuals, monthlies and challengers, you’re off the hook – no charges for you! If you’re signed up for class but are running late, please call your local studio so we can make sure to hold your spot. Calls will be answered in the 30 mins before class starts. Do not leave a voicemail. If there is a waitlist and we have not heard from you by class start time, your spot will be given away. Doors may lock 5 minutes after class start time. If you put your name on the waitlist and a spot opens up 12 hours before class start time, you’ll get an email and/or text. Make sure you manage your notifications on the app so you get them to your preferred phone and email. If you no longer can attend class, make sure to cancel before the 12 hour mark. We assume that if you’re on the waitlist 12 hours before a class starts and get into that class, you’re coming.